Uzbek President will visit Prague after all. If case he wins next elections. Anyone doubtful he will fail? Uzbek President Islam Karimov, whose trip to Prague was cancelled and indefinitely postponed, will be able to travel to the Czech Republic in 2015, in case he wins the next elections and remains president. An article carried by the Prague Post on October 6 was entitled “Uzbek Dictator to Visit Prague in 2015”. According to the publication, Hynek Kmonichek, head of the Czech Presidential Office foreign affairs section, informed the journalists about the invitation. At the moment, according to the Czech News Agency, Mr. Kmonichek is currently paying a visit to Uzbekistan. The Czech mass media suggest an intrigue in the matter is whether the incumbent president of Uzbekistan will be able to win the upcoming presidential elections in the early spring of 2015. Therefore, President Karimov’s visit to Prague can only be planned after he is announced the winner of elections and his inauguration is held. Should President Karimov not emerge victorious at the polls, his political opponent would travel to the Czech Republic. It is to be noted that there is no more hope that said elections could be held openly and fairly in Uzbekistan. Islam Abduganiyevich Karimov, who formerly was First Secretary of the Central Committee of the Communist Party of the-then Uzbek Soviet Socialist Republic, has been holding onto the post of head of the Uzbek state for the last 25 years. There are no indications whatsoever that he is willing to leave post and let someone else take the helms of the Uzbek state. 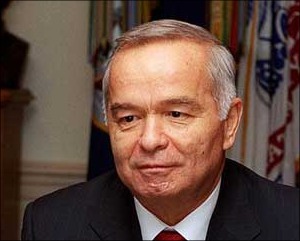 Throughout his entire reign, Islam Karimov has established a system of one-man rule that provides no room for political competition or respect for constitutional rights and liberties of the Uzbek citizens. Islam Karimov’s visit to Prague was initially scheduled for late February 2014; however, an outcry on part of international human rights watchdogs forced the official Prague to withdraw the invitation.